For the 4 million children conceived through in-vitro-fertilization, the 2010 Nobel Prize for Medicine, awarded on October 4th, is understandably, good news. Congratulatory statements are also pouring in from advocacy groups, fellow physicians, prominent parenting blogs. How this news plays out in the unfolding story of Assisted Reproduction and its role in shaping our healthcare, medical research, economy, the air we breathe and the soil we count on for food, depends largely on how the rest of us respond to the announcement of this prestigious prize. Medical technology is a powerful tool that helps or harms depending on how we use it. In the last decade and a half of my work as a fertility educator, I’ve celebrated the arrival of many IVF-conceived babies, with mothers and fathers who followed this road to parenthood attentive to internal cues, protective of their overall level of health. I have also seen women, propelled by fears of childlessness, reach for the big guns of IVF as a way of tuning out the body’s call for attention. For them, a potentially useful tool became a self-punishing weapon. What the wave of jubilation has washed away from public view is the $5 billion-and-rising cutthroat industry. An industry competing for customers with discounts, advertising and a lure of the latest breakthrough technique. Sadly, the sound of cheering is drowning out the voices of the many millions of women for whom IVF became a revolving door of endless egg retrievals and embryo transfers; women, who entered the promised land of Assisted Reproduction, blasted their ovaries with progressively more aggressive protocols, only to return years later, childless, broken and broke. Motherhood and pregnancy are emotionally charged experiences. Guiding wannabe moms on the baby-making-road I have found that reproductive challenges are often linked with unresolved inner conflicts, memory of sexual abuse, birth trauma or other issues imprinted in our tissues. I have witnessed the resolution of such conflicts lead to natural conception, even for women with a history of failed high-tech treatments. Sometimes the missing piece of the puzzle is a latent nutritional deficiency that allows individuals to function but impedes the more challenging task of implantation, gestation and birth. A thoughtful change in diet and lifestyle can often restore balance creating a more life-friendly inner environment. The attempt to side step such symptoms by revving up our ovaries with synthetic stimulants might not only further disrupt endocrine function, it robs aspiring parents of the opportunity for healing that comes with every health crisis. A 2002 report in The New England Journal of Medicine examined the incidence of health problems in babies conceived through in-vitro as well as children conceived through introcytoplasmic sperm injection, in which the egg is fertilized by injecting it directly with the sperm. Reviewing data from registries of birth defects, the investigators found that 9 percent of babies conceived through treatments had chromosomal abnormalities, heart, kidney, and urogenital defects—compared to 4.2 percent of babies conceived without treatments. For me, the study raised a different set of questions: If your car begins to break down, chances are you will take it in for repair, rather than force it into higher performance. Doesn’t the body deserve similar attention? Wouldn’t make more sense to address the underlying medical problems that might’ve triggered a couple’s inability to conceive, rather than force the body into doing what it may not be ready for? Achieving a full term pregnancy is still one of the challenges where certainty eludes even the best and the brightest. 32 years after Dr. Edwards’ historic birth announcement and millions of dollars spent on research, the chance of a healthy baby after treatment, remains low: 28.2% for women under 35, falling to 10.6% for women 40- 42. Something about conceiving a child makes it startlingly clear that we are more than a collection of well-designed organs. At the announcement ceremony professor Christer Hoog, the member of the Nobel assembly declared IVF a “safe and effective therapy,” regulated by “strict ethical guidelines.” He must’ve missed the 2009 study–one of many worrisome findings–published in the American Journal of Epidemiology showing a link between ovulation-inducing drugs and increased risk of breast cancer by 42%, 4-6 times higher risk of uterine cancer and 2-6 times greater risk of malignant melanoma. As for strict ethical guidelines? Perhaps professor Hoog could arrange for a private viewing of recently released Made in India, a sobering documentary about the exploitation of impoverished Indian women as surrogate mothers. Eggsploitation, a disturbing film featuring young egg-donors– who suffered brain damage, strokes, or nearly died of complications resulting from the procedure done to retrieve the eggs –might be another useful source of information. This has become tragically true in the unregulated field of assisted reproduction. Unless more patients and doctors begin to speak up about the dark side of this friend, the earth-community has yet to see the immense environmental impact and healthcare costs of the rising number of state-of-the-art clinics worldwide. A dubious legacy for the not-yet-born generations of children we so fervently long to bring into the world. Ultimately, what’s most troubling, is that a stamp of approval from such a prestigious– albeit in this case– poorly informed committee, will do more to serve the pecuniary interests of an exploitive industry, than the interests of couples Dr. Edwards once set out to help. The illusion that ART is the benign medicine for the “illness of infertility” will make resisting the lure of the quick fix even more difficult. Thank you for sharing your wonderful story with us. Many blessings to you. Thank you Julia for writing such a deep article on this controversial subject. After seeing a friend of mine getting quickly out of shape after being heavily injected with IVF-related hormone drugs and yet unsuccessful after many attempts even with a donor egg (! ), I remain fairly skeptical of the success rate of this procedure. Perhaps this sheer force approach is justified when a woman has tubal blockage, or when her ovaries are not functioning properly, yet I suspect (based on my friend’s example) that IVF is often recommended to the couples who could have conceived naturally had they embraced a more holistic approach, changed their lifestyle/diet, or simply waited a little bit longer for the right egg/sperm/moment-in-their-life combination. I am talking here about the couples who are diagnosed with the so-called “unexplained infertility”. So, it’s not that much the technology itself at fault here, as much as the greedy infertility industry widely abusing it’s usage. I am also amazed to see how the IVF success rate of women over 40 (with their own eggs) who tried the procedure is extrapolated then onto the general population of all 40+ women! ‘You want the car to run? Do you want to know what’s wrong with it or do you want it to run? We can tear the car apart and find out what the problem is, or we can just get it going for you, and it would be a lot faster and probably easier just to get it going.’ That told me this is our man, this is our guy. He really had that mentality of let’s do what’s good for you, if you really need to know what’s wrong with you, we’ll do it, but if you want a baby, let’s skip over this other stuff, so that’s what we decided was the best thing to do. devastation. We desperately need this wake up call. Really informative Julia! Thank you for this post. I was told that I’m not a “candidate” for IVF, so it’s not something that I know a lot about. I also was surprised by the low success rate and I do know most insurance does not cover anything reproductive. Thank you for writing about these issues. Julia, I love that you are so passionate about your work. This article really resonates with me as I have also gone through two failed IVF cycles in which PGD was used to prevent a genetic disorder for which I am a carrier of. I never tried to conceive on my own before jumping into ART and I felt the doctors all pushed me and told me this was the way to go. It was my fear that turned me to Microst/sperm sorting and IVF and I realize that my body in a state of fear cannot conceive. It is so important for us women to listen to our bodies and know what is best for us. Yes, IVF is a great tool but as you always say a perfect egg and sperm coming together to make an embryo does not always equal a baby. There is a lot more to the “holy human loaf” and I think we need to address these issues before going forward with any type of ART. Interesting, I’m glad I read it. Thanks Julia. Julia, this resonates so much with me. I am a prime example of someone who threw herself at the mercy of the fertility doctors, subjected myself to, as the doctor put it, “the highest doses I’ve ever treated someone with”. A little voice inside me kept saying, this is insane, there has got to be something else I can do to help this along such as diet or exercise. I even did my own research, tried to diagnose myself and brought stacks of research papers to my doctor trying to help his “diagnosis”. After several failed IVF attempts that voice grew louder. Now it is screaming at me, pointing out all the signs that my body was telling me, that it’s been fighting me the whole time, trying to tell me that this wasn’t the way to have a family… refusing to respond to hormone stimulation through shots and pills, not giving the doctor the expected blood test results and not following the calendar the way the nurse had predicted. It’s similar to other diseases manifesting themselves in the human body. Just because it manifested itself in the past year or even a few months, doesn’t mean the body hasn’t been fighting it for many years. The body is under constant inflammation in an effort to fight imbalance in the body – but it’s when it can’t fight it anymore under the conditions we are living that it finally lets the symptoms surface. I feel it is the same thing with infertility. It’s a sign that something much deeper, much more profound in the body (the human loaf) has not been balanced for years… but I’m only just noticing it now because infertility has finally reared its head. I was forced to open my eyes with the jarring wake-up call. I pray that others will wake up and discover themselves sooner. I wanted to share my story here because I think it’s a great example of what this blog is all about, and I hope my story will be inspiring to others. We started trying to have a baby in the fall of 2005. Soon after I stopped taking the pill, I thought I was going to be one of those lucky ones that get pregnant right away because my period didn’t come for around 60 days. I kept taking pregnancy tests thinking the next one was going to be positive. Eventually it became clear that my cycles were pretty much out of sink, and that I was going to have to wait a little bit; they were lasting between 50 and 60 days and I didn’t even know if I was ovulating or not. After 6 or 7 months, I started working with a naturopathic doctor. She taught me how to take my basal body temperature so I could understand my body better, and started prescribing some natural fertility remedies. After 2.5 year, I got pregnant. Back then, pregnancy equaled baby. I went for my first ultrasound at 10 weeks, and the baby didn’t have a heartbeat. Four moths after, I got pregnant again, but then the 8 weeks ultrasound revealed no heartbeat again! I kept eating well and working with my doctor, and trying to get pregnant, but it was just not happening. One day, my doctor recommended checking the Fertile Heart website. I did, and read about Julia, her story and her work. I decided to buy The Fertile Female; I loved it from the first page. It was a book full of hope, empowerment and tools. Soon after that I also bought Inconceivable, I just wanted to know more and more about this miracle so many women had experienced with her method, hoping that it was possible for me also with a little bit of work and commitment. I loved both books; I would totally recommend anybody trying to conceive a baby to read them and applied them to your life. After reading both books, I started participating in the Fertile Heart phone circles, sharing my feelings and asking questions. I even scheduled a private phone session with Julia. I started practicing daily the techniques described in the book, and doing the homework from the phone circles. In February I decided to attend the one day intensive workshop in Woodstock and came away with some important revelations about why I might not be getting pregnant. By mid April I found out that I was pregnant again, this time the ultrasound showed a beautiful little baby with a strong heartbeat. My pregnancy has been easy, with no complications . Today I am 34 weeks pregnant, and I am expecting a healthy baby girl. It’s been a 5 year journey. There were times when everybody (including my parents) was pressuring me to do ART, take some Clomid or try something else. Today I can say I am glad I stood my ground and I followed what felt right to me. I am a very different person, and I will be a much better mom. This has been a life lesson for me, and a huge part of it, I learned through the Fertile Heart Ovum practice, and The Fertile Female. I first heard of the nobel prize on NPR. I was so disappointed with the coverage as it was all one sided. All it covered was how great ivf was and how many babies were born via ivf. In essence the BL show barely scratched the surface. I was at work so I could not call in and I do not have access to wnyc at work for some reason so I could not even post a comment.I just sent a comment to the show on NPR that they need to cover the other side of the story. 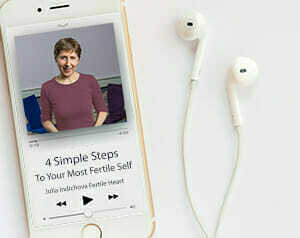 What rose up in me reading this blog and hearing about this prize is that “I need to tell my story.” I need to talk about how I started ivf when I was just 32years old and since my ovaries did not respond with a lot of eggs or atleast 3 of the same size, the doctors (who are supposed to be published experts in their field) blasted my ovaries with the highest doses of drugs possible and how over the next 6 years my fsh went from nothing i.e. a one or two when I started this process the teens.. I need to share how even the clinics that claim to be less invasive will continue to prescribe clomid cycle after cycle until I finally said I had enough. Yes part of the responsibility was mine and I should have stopped sooner. I grew up thinking and looking up to doctors as authority figures and people who’s instructions you need to follow. It never occurred to me until I started working with Julia and using the fertile heart tools that I was the ultimate authority on my body. I look at this as an opportunity and a “gift” from my unborn child. In fact I am certain it is a beautiful gift and that this is one of the reasons our baby has not arrived yet. Just as I am certain that I will have a baby in my arms some day soon. So how do I go about telling my story..? perhaps this is a start to blog and comment on various notable websites about this prize, to start to journal about by my experience with ivf to date, to start a peer circle in my area so I can share parts of my story and spread the word about the fertile heart. This energizes me to get started. Julia’s blog is a good reminder that IFV is not a short cut when comes to reproduction. It’s so easy to get caught up those short cuts. Every cycle I try something different to try to become pregnant. Maybe if I avoid eating cheese, I will get pregnant, maybe if I try meditating or going to acupuncture, I will get pregnant. It’s very difficult to keep sight of the “big picture”. Julia’s blog reminds us to keep the “big picture” in mind, teaches us to trust the signals we receive from our own bodies and make decisions based on what our hearts are telling us. This is the Mystery that Julia speaks of, and it is not always in Mystery’s plans to be forced. Gentle but brave and strong, energetic but not aggressive… Julia, your beauty and determination shine through once again in this post. Personally, I’ve always had a kind of instinctive refusal for IVF, but I’ve watched friends throw themselves into it with the kind of desperation you describe, and it really is heart-breaking to see them getting chewed up and spat out again, even more worn and battered than before. Thank goodness for voices like yours that help shine a light on our inner truths, and offer a real alternative. Thank you for such a thoughtful piece. My husband and I are an “older” couple trying to conceive. We were amazed at how quickly the “fertility specialists” in our community (we live in the 5th largest city in the U.S. and went to see two of the top docs in town) immediately said we should do IVF, even though there is nothing physically wrong that they can point to. Rather than work with us to conceive naturally, they immediately want to employ this expensive and drug-intensive therapy. While I’m certain IVF can be miraculous, it also seem dangerous…and very expensive, with no guarantees and low success rates. It is important for people to consider all sides of this issue, and thank you for so eloquently bringing that to light. Very interesting post Julia. It is so true that we humans now a days are so eager to obtain the quick fix to our problems without looking inward and holistically at the source of our “issues”. As a cancer survivor who went through tremendous medical technologies to be alive today, this sharp contrast between natural remedies and high tech remedies is constantly been on my mind. On one hand these people who have these amazing brains created these groundbreaking studies to help couples and families live out there dreams. These families work hard and long to afford and pay for these dreams. And as stated millions of lives are here today living and creating. On the other hand you look at the not so cheery side as you stated in your blog. The “victims” of advanced technology. Alas another inevitable dichotomy of life. Do we stop scientist from creating? Do we return to ancestral lifestyles? I agree with your practice not because it defies IVF. Because it empowers people. It empowers people to remember that they are rational, thinking human beings that can in fact know more about themselves than any other person out there. And if from that space of knowing that one comes to the conclusion that IVF is in fact their tool…then that is a great thing. One more thing…. Resources. I feel couples become so desperate about baby making that they irrationally throw resources away without researching and weighing pro’s and con’s. See a financial counselor…or just review your resources both monetary and emotionally before you ride that wave of IVF. Because the tide comes in real quick. It’s amazing how low the success rates (28.2% for women under 35, and 10.6% for women 40- 42) and expensive the fee for IVF is. It’s interesting also how most IVF clinics have FSH cut-offs, so if your FSH is over 10 or 12 you won’t be accepted, to help keep their success rates high (which really aren’t high at all in the first place). Still IVF has been a wonderful option for many. I had no idea about the “egg business” in India, this is a whole other dilemma. I understand how you feel. I understand how frustrating it is to witness money and the race against time come before health and best interest. Our culture wants the fastest solution to problems, especially in desperate times. Many people cannot understand the deep-rooted wounds and subtle causes to infertility, especially those who are so desperate for an immediate answer. To look outside is much easier than looking within. Especially if looking within stirs up painful memories and uncomfortable feelings. You have to be ready for that journey. Patience is another skill that is so needed in this process, when one feels that the clock is ticking, it’s very hard to be patient. It is even harder to stay attuned to the body and mind when panic knocks on the door. It is an industry capitalizing on feelings of panic. It took me ten years to realize that my irregular menstrual cycle wasn’t a symptom of polycystic ovaries, (as some fertility doctors suggested) or a sign that something was perminately wrong with me. As soon as I tuned into my body and listened to its needs, my cycle normalized. Your analogy of the car was a great parallel. Why impose, force, and push, rather than gently guide it to a place where it can get repaired? Keep writing, sharing your ideas, and opening your heart. Lots of warmth on this journey ahead. More than anything, community and support. Women (and men) aren’t machines with broken parts that need fixing. We are the sum of an integrated system–a complete system that dramatically changes with every life experience. You cannot change the mind without also changing the body. So sticking to physical solutions or focusing only on one part of the body (ovaries, hormones, eggs, tubes, etc, etc) without addressing the whole seems rather absurd. Julia, this post was so thoughtful and important. when I started this journey I was open to whatever would get me to my goal–a child. When clomid failed I was moving onto an injectable fertility treatment (and possible ivf) until my high fsh prevented me from continuing on that path. I know I would’ve tried this route if I was a candidate even though it would have cost thousands of dollars and had done who knows what to my body. I know I wouldn’t have had the strength to turn it down. Now, with the help of you and FH, I’m gaining a deeper understanding of myself, my body and my journey. I believe this was meant to give me the opportunity to grow and learn about myself as well as heal my body and not force it to perform at a higher level. I struggle with the frustration I sometimes feel about my personal situation but that’s part of the healing I need to do. I do believe ivf can be the right path for some but I still feel ART is big business and I don’t think anyone can deny it. And it really worries me that this endorsement might give a false sense of security. Thanks for blogging on this topic Julia. IVF does seem to be the big guns of the community. But for being so amazing it does seem it only help some people and many in their late 30’s and 40’s are discouraged or don’t qualify. It seems the goal as it is in so many industries are finding a simplistic formula toward results – those that don’t fit are pushed out of the equation. It would be wonderful to see this specialty as well as medicine in general realize more purposefully the benefit of simpler approaches which actually feel empowering and that that in itself could be helpful. IVF is a wonderful tool which may have won the nobel prize and deserved to but the industries bedside manner certainly needs improving. Argh, sorry for my last glitch. I wanted to say – Oh yes, I also meant to write that I really think Fertile Heart is groundbreaking work. I don’t think that there are too many fertility educators out there. I hope that this changes over time! Great article! I especially liked learning about the term technopoly. I think it’s so relevant. It makes me think about the limits of evidence-based testing and wonder why our society has developed the way it has – so recklessly! Thank you for being the voice of hope that says there is another route besides technology. Many times women have heard the pronouncement ” you will never have a child” and go on to have a child, just like you did. There is more to this mystery than statistics and medicines. They have their place too, but that is not the whole picture. I wanted to let you know that through this past week’s struggles with navigating the medical field to get the attention I needed and wanted, this piece, and you, were constantly there to guide me. You have written a piece that is compassionate and thoughtful as much as it is intelligent and critical of our human need to achieve things as fast as we can, without taking the time to stop and be truthful to ourselves. I hope this gets read by millions. This past week I have called a former doctor’s office to inquire about having another HSG. As I mentioned to you a while back, I have been worried about my right tube, since my HSG 2 years ago was fairly inconclusive. I called the doctor with whom I had had my three IUI’s at the beginning of this year. After a few days, her nurse finally got back to me and left me a phone message- “I am looking at your records, and you had an HSG 2 years ago, then 3 IUI’s. There is no need for another HSG. If you would like to come in to see Doctor N. about possible IVF, which would be the next step, please call us.” Without even speaking to me, they were making a decision on my “next step” to try to achieve motherhood. Thank you, Julia, for helping to arm myself with enough strength and guidance from my ultimate mom to respond to this phone message in an appropriate way! Needless to say, I did not call that doctor back, and returned to a former doctor I had seen a ways back. I went in to my visit with a clear understanding of what it was I wanted, and I wasn’t going to take “no” for an answer. For the first time ever in a doctor’s office, I didn’t cry, I felt calm, assured, and strong. I told him about my work with you, and then said I need to know if my tube is clear and open, and I would like an HSG. He scheduled one for the next morning! I had it, it went great, and that dye spilled right quick out of my tube. All is open and good. My point in sharing all this is that I genuinely felt my strength, my ultimate mom, in this recent navigating of the medical world. I was once so insecure in advocating for myself, because I didn’t know how. They would tell me what I thought I needed, and I would agree. It’s amazing the power they have over someone who is not prepared or emotionally able to speak up, say no, and advocate for her body. Thank you for writing an article that highlights the need for people to get in touch with themselves. I enjoyed your analogy of the car- very clever. We certainly don’t make our cars go into overdrive when they are not performing, we slow them down and try and figure out the cause of their behavior. Julia – Thank you so much for your courageous voice against a powerful industry! I deeply appreciate your commitment to truth and well-being. You are a blessing. It is refreshing to read your thoughts about this, Julia. I too felt somewhat conflicted about the message this award communicates to all of us. My “western medicine” diagnosis is Premature Ovarian Failure based on high FSH and was given a 1% chance to conceive with my own eggs. I was diagnosed at 36 yrs. Since I am not a candidate for IVF and do not respond to ovary stimulating drugs, I have been left out and “marginalized” by the western field of reproductive medicine. Although IVF has been an amazing miracle for many parents, I feel that reproductive medicine has focused too much on IVF and fertility drugs as the “solution” to infertility. Considering the low pregnancy and birth rates AND potential risks and consequences of IVF, how can medicine be so narrow focused and not look more intently at the bigger picture affecting male and female infertility? I hope this discussion enlightens all of us in the fertility community to see and believe beyond drugs and technology and embrace a more holistic understanding of health, creation and life. Having tried to conceive ‘nature’s way’ for 7 years and being open to many forms of treatment and therapy’s we conceived 2nd cycle IVF. I refuse to be ashamed of having this treatment, we have a wonderful healthy and so happy child and we feell very blessed. Whilst completing the treatment 2nd cycle I did a lot of work on myself – yoga – affirations and accupuncture. I really looked after myself and nurted my body in every way that I could. I had hope and believed that the treatment would result in a healthy baby – and it did. We are amazing but complex beings in many ways something that I do not think science will ever understand. In case you are wondering it was abnormal forms in sperm that prevented them penetrating the egg, so we had ICSI. This is why we had IVF as my husbands sperm never changed over time with various and expensive natural treatments. We are all on our own journey and I wish everyone who reads this HOPE and LOVE. I was reading the last comment about doing more research, and I thought of the story in the last chapter of The Fertile Female that I always find very moving. I hope it’s okay to post a few lines from it. It’s the story about the women who are deciding what they should pray for. “We cannot pray to end starvation, for we have already been given the soil to grow enough food to feed the whole world. If only we would use it with care. We cannot pray to end disease, for we have already been given the wisdom to find healing for everything that ails us. If only we would use it.” It’s true that billions of dollars are spent on research of these things and every study ends with, “we need more research.” And then the next study that comes out tells us that the previous studies were all wrong and women who followed the recommendations of those studies have died. Like all the stuff now that’s coming out about HRT and cancer. My mother has been taking it for years because her doctor assured her the studies said it was okay. Now he says he is shocked to hear it’s not. Is that going to help my mother if she God forbid gets cancer? Thank you, Julia for this blog. It takes guts to do what you do. I’m learning a lot from this work about speaking up for myself in so many, I mean so many places in my life. Like Suzanne, I was wondering whether the research that is currently done to perfect IVF procedures could be used instead for other types of investigation into the causes of infertility. In the history of science any so-called progress has often happened at the expense of alternative solutions or breakthroughs. Science is not objective in the sense that the decision of where and on what to do research is always politically determined. The decisions of what to fund is political. Maybe this Nobel price could also be an opportunity to advocate for a different use of funding and medical research. There might be something in the work of these physicians that can be saved. There might be someone out there that has an idea for where to re-start from. We are all well aware that our fertility is way worse than that of our mothers and past generations. Many of us have experienced the power of healing but at the same time I feel we would benefit from more research, more attention to the issue. Your work has brought us new clues as to why our bodies shut down to the possibility of parenthood. I hope this Nobel prize will bring more attention, which means more minds, more ideas, more hearts devoted to this issue. Many might think that this is impossible, but aren’t we (FH community) trying to train ourselves to the possibility of miracles? This is beautifully written. Thank you, Julia. I love what you share and your analogy about the car. These are my sentiments exactly. It has been a long, interesting, challenging, exciting, growthful, healing five years (and counting) journey towards meeting our child. I was immensely lucky to find Fertile Heart early on. It completely opened up the experience of infertility – opened myself up – in a way that doing IVF straight away NEVER would have. Of course there have been times along the way when my frustrated and impatient orphans have come out of hiding and been thoroughly pissed off that I have to wait, that my body fails me (in my orphan’s eyes! ), that I feel as if I am being punished by having this happen to me and at any time I could have jumped onto the IVF carousel. This would have been an orphan reacting to another orphan. No healing comes out of that. Baby or not. That would just be pushing the orphan back into the orphanage only for it to come out of hiding at a later date. I’m not saying that IVF is bad or that I could not choose to do it from my Visionary, it’s just that it is my last resort (for many reasons, some of which you share in your blog) and I really want to have my body in the best condition possible before I do that. It is a timely blog for me because my menstrual cycles have been getting increasingly erratic and long and my wonderful holistic gynae has told me I have ‘lazy ovaries.’ Everything else is fine – FSH, ovarian reserve, blood flow to the ovaries, thyroid etc. So what, I wonder are my beautiful ovaries trying to tell me? Whatever it is, I want to listen. I am sure there is gold there. I don’t want to shut them up by taking Clomid. And there is no guarantee of course that they would respond! I found that 42% increased chance of breast cancer statistic truly alarming. I really feel that if I can give my body what it needs and heed it’s guidance, I will ovulate. It’s just the next step, the next guidepost. Another reflection I had about your blog Julia concerns looking at the cause of infertility. Where is this mentioned in the whole IVF industry? I had a quick google to try to find out how much infertility has increased in the past few decades. There is conflicting opinion on whether male fertility has decreased (a flawed study etc.) – I need to research more and perhaps Julia (or others) may have some data to hand. I would hazard a guess though that infertility is on the increase and people viewing IVF as a solution – and not looking inward or even outward for a cause – will do nothing to improve our lot as humans or the planet and will only further line the bulging pockets of the IVF industry. Babies are being born “pre-polluted with nearly 300 industrial chemicals, pesticides and contaminants, many of which have been found to cause cancer in lab studies or in people.” (Source: EWG). We really need to do things differently! Those of us blessed with the gift of infertility can do much to champion the rights of the yet-to-be-born and make ourselves and the planet healthier. IVF cannot be viewed upon as THE solution to the childless. It has it’s part – if used in a life-enhancing way. The same way that all the ‘green’ innovations like solar farms and wind turbines do. But there is not much point just ploughing on as normal – using renewables to continue living as if there was no consequence to the planet how much energy we use (and waste). My husband is passionate about the environment and works in the green industry. He has told me that sometimes he wonders if all the green sector is doing is just allowing people to continue as they are and not having to alter their lifestyles. Because at the end of the day the two go hand in hand. Just as they do with choosing IVF. We can choose IVF at the same time as doing our inner and outer work. And don’t even get me started on the exploitation thing Julia! I learnt the other day that drug companies charge hundreds of pounds for hormones used in IVF that cost pennies to make and are used in the contraceptive pill (and sold cheaply in this form). The longing to have a child is so deep – and can leave women very vulnerable – and my cynical orphan would say that the IVF industry is wise to this. It is a commercial business after all. The same way that when you put ‘wedding’ in front of anything – cake, meal etc. – it doubles the price! Well the same would appear to be true in IVF. I realise I sound as though as I am IVF-bashing. This is not what I mean. I just feel passionately that we must engage with IVF in a holistic way. One step at a time. Thank you Julia for your blog, for your inspiration, support, guidance and perseverance. I look forward to reading others’ comments. Julia, what a fantastic, well thought and written post. Having just gone through an IUI where I felt part of the fertility industrial complex your post comes at a good time. To proceed in our journey wiht our eyes wide open! Thank you for protecting and empowering us with your knowledge and creating a safe place to engage. awesome. so well put and so fllled with the ferocity that this deserves and you bring to it (in some ways, representing so many of us who have not yet found our voice here). Thank you Julia.